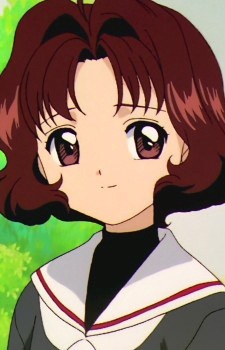 Rika Sasaki is a classmate and friend of titular character Sakura Kinomoto. She is considered to be very elegant and mature for her age, though she can also be shy. During the series, she is also shown to be a skilled cook and very good at crafts. During the series, Rika is affected by the Clow Cards several times. Early in the series, she buys a brooch that is actually The Sword card. The card takes her over and causes her to attack Sakura. Sakura is able to stop Rika by using The Illusion card to show her an image of her beloved, allowing Sakura to capture the card. During the second half of the series, she is nearly drowned during a magical trial Eriol Hiiragizawa created to cause Sakura to convert a Clow Card to Sakura Card. During the series, Rika is shown to be in a romantic relationship with her teacher Yoshiyuki Terada. In the manga series, they are engaged to be married when she is old enough, and they frequently spend time alone together on "dates." In the anime adaptation, the engagement is removed as are many of their dates, however they are still shown to have affection for one another. Rika gives Terada the hand-made teddy bear she made, and he names it after her. In both the manga and anime, when Sakura uses the Illusion card to stop Rika's attacks, she calls the image "Sensei" which means "teacher" in Japanese. During the final judgment when Yue shows Sakura a world where everyone has lost their feelings for the one they love the most, Rika is shown handing Terada a paper without her usual blush and shy look. In the Cardcaptors English adaptation, Rika's name is changed to Rita and all hints of her relationship with Terada are removed. Instead of being a good student, she is depicted as having trouble with her school work and her blushing around Terada is explained away as being embarrassed at having to stay after school so often.